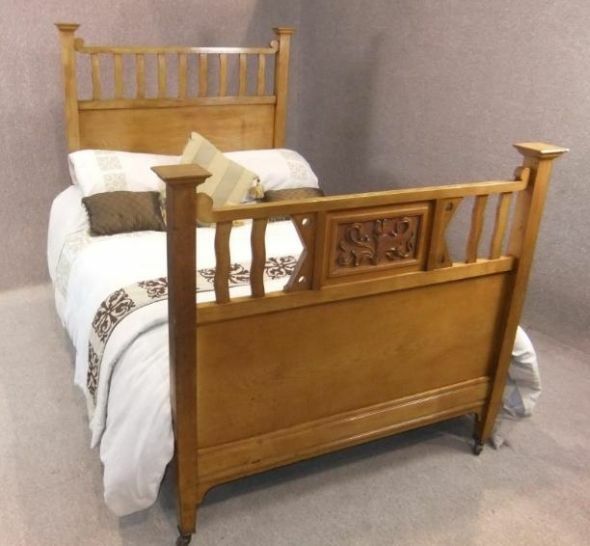 An elegant circa 1900 arts and crafts 4ft bed. The bed is constructed of English ash, and has a decorative footboard and headboard. This bed comes complete with its original timber sides which will support one of our newly made pine slatted bed bases; all that is required is a 4ft mattress which can be easily purchased. The bed is in lovely condition for its age, with just the general wear and tear which is to be expected from an antique piece of furniture. This arts and crafts bed breaks down into five individual pieces for ease of transportation and reassembly, and is ideal to complement any period bedroom setting. The timber is very similar to a golden oak.